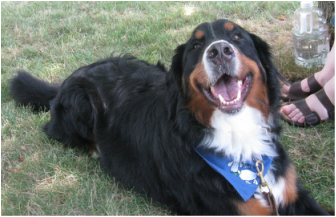 As a member of the Canadian Kennel Club and affiliated with other Bernese Mountain Dog Clubs we work closely with them on dog shows, rescues (when required) and promoting the breed.﻿﻿﻿​ We celebrate this breed! Back Packing 2015: Bronze Award. Club started in 2008 out of the group originally called Clandestine Carters Club. The Club Constitution, Standing Resolutions, and Code of Ethics was adopted on September 13, 2009. CKC accreditation was received on June 23, 2010 and at conception we had 11 members. Our first two major equipment purchases for the club were r the large club tent at a cost of $70.00 and a set of CKC regulation jumps expertly made and donated by Allan Lingelbach. 1. Winter Walk was January 17, 2010 at the Davies’ home in Princeton. 2. Fun Day, along with the 1st Conformation Sanction Match was held on July 25, 2010 at the Wagenblast’s home in Caledonia. 3. Official Draft Test was held on September 25,2011 at Wellesley.